Where does Feyenoord go from here? With Fred Rutten leaving Feyenoord before the end of the season, and before the crucial Europa League play-offs, its leaves the great Rotterdam side in a sorry state of affairs despite finishing fourth in the league writes Max Griffin. After crunch talks with Martin van Geel, the clubs sporting director, Rutten and the club have decided to part ways. Meaning they go into the crucial play-offs manager-less and in very poor form, three losses and two draws in their last five games to be exact meaning AZ pipped them to the crucial third spot and an automatic Europa League place – it’s also the first time they’ve finished outside the top three since the 2010/11 season where they finished tenth. It’s not exactly surprising that the club have had an indifferent season this term, with them deciding to sell five key players in the summer. This included 23-goal striker Graziano Pelle and Dutch international right-back Daryl Janmaat without adequate replacements coming in to reinforce the squad. This made them unable to compete for the title, something they had the basis to do with the squad that finished the 13/14 season (other key players sold in the summer: Bruno Martins Indi, Stefan de Vrij and Ruud Vormer). If they do manage to qualify for Europa League, even though they are some way off yet with Heerenveen and either PEC Zwolle or Vitesse standing in their way, it would merely be a consolation prize from a season largely filled with disappointment. 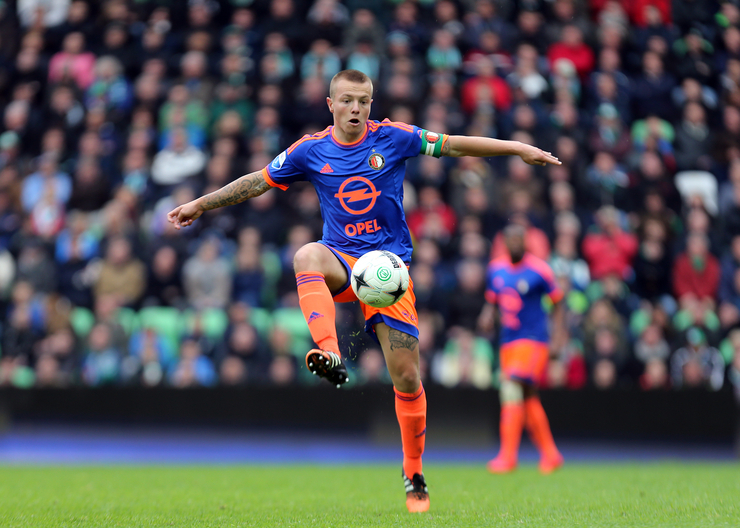 With rumours already beginning about key players at the club such as Jordy Clasie, Tonny Trindade de Vilhena and Lex Immers wanting moves away from the club to pastures new, the squad at De Kuip could be left with big gaps, and players such as captain Clasie will be hard to replace. With last summer’s recruitment not going entirely to plan, the club left themselves worse for wear and it has affected them this season. Most notably at the start of the season where they managed only five points from their first six games, patches like this one and their most recent wobble where they have lost three games in five are why they have struggled to finish fourth. With the inexperienced Giovanni van Bronckhorst now took over and rumours of major exits this summer, it is down to the board to get it right with their summer business, if not another poor season surely awaits the club, creating further unrest in the stands. The signs are that things could be getting worse for Feyenoord before they get better. If things are not sorted out quickly by the board, starting with the crunch match with Heerenveen on Thursday where a loss could see the side without European football for the first time in three years, something a club of their stature would expect every season. If the board don’t get things right, could a repeat of the 2010/11 season where the club finished tenth be on the cards? Click on Max’s name above to follow him on Twitter.